Stuart Campbell Mayer joined the Royal Australian Navy (RAN) in 1984 and commenced training as a Seaman Officer. He gained his bridge watch-keeping certificates in the patrol boat HMAS Gladstone and the frigate HMAS Darwin and completed the air intercept controller course at RAAF Base Williamtown. He then served in the frigates HMA Ships Canberra and Sydney. Lieutenant Mayer deployed on board Sydney as the air intercept control officer and boarding officer during that ship's operational deployment to the Arabian Gulf during the 1990-91 Gulf War. 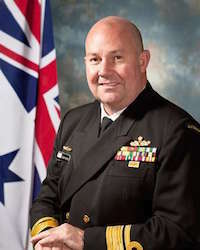 In 1993 he commenced training as a principal warfare officer (direction) at HMAS Watson and graduated in 1994. He also saw service as the Combined Task Unit Operations Officer in HMAS Adelaide during Operation STABILISE; the Australian Defence Force (ADF) operations in support of East Timorese independence during 1999. On promotion to Commander in January 2000, he was posted to the United States as the first ADF liaison officer to US Joint Forces Command based in Norfolk, Virginia. On return from the US in mid-2002 he assumed command of the frigate HMAS Canberra continuing an association with that ship that included service in every rank from trainee to commanding officer. Upon leaving Canberra in July 2004, he was promoted Captain and assumed the position of Chief Staff Officer (Operations) at Maritime Headquarters (MHQ) Australia in January 2005. While posted to MHQ, he was seconded to the Australian Maritime Deployable HQ staff for duties as Commander Task Group 58.1 - Northern Arabian Gulf Maritime Security Operations Commander for which he was awarded a Commendation for Distinguished Service. After six months in the Gulf, he returned to MHQ in October 2005 and resumed his duties as Chief Staff Officer (Operations). In January 2007 he attended the Australian Defence College and read for a Master of Arts in Strategic Studies. He assumed command of HMAS Anzac in December 2007 completing deployments to Exercise RIMPAC and to Southeast Asia as the Commander of the RAN Task Group. In January 2008 Captain Mayer was awarded a Conspicuous Service Cross for outstanding achievement as Chief Staff Officer (Operations) in Maritime Headquarters. He was promoted Commodore in mid-2009 and appointed Commander Joint Task Force 631, the multi-national International Stabilisation Force, in East Timor in October 2009; the first non-Army officer to hold this command. On returning to Australia in 2010, he assumed duties as Commodore Flotillas, subsequently Commodore Warfare, at Fleet Headquarters. Highlights in this period included the opportunity to act as the Expeditionary Strike Group Commander during Exercise RIMPAC 2010, and the first non US Commander of the Combined Force Maritime Component in Exercise RIMPAC 2012. Commodore Mayer was awarded a Bar to his Conspicuous Service Cross (CSC) in the 2011 Australia Day Honours List for outstanding achievement in a non-warlike situation as the commander Joint Task Force 631 on Operation ASTUTE in East Timor from October 2009 to February 2010. This was followed by an appointment to Navy Strategic Command as Director General Navy Capability Plans and Engagement and then as Chief of Staff before being promoted Rear Admiral and appointment as the Fleet Commander in June 2014. Rear Admiral Mayer was appointed as an Officer in the Order of Australia (AO) in the Australia Day Honours List 2017 for distinguished service to the Royal Australian Navy principally in key command roles. In January 2018 he relinquished command of the Australian Fleet and took up his next appointment as Head Force Design (Vice Chief of Defence Force Group) in March 2018. Rear Admiral Mayer is a graduate of the Centre for Defence and Strategic Studies, RAN Staff College, holds a BA from the University of New South Wales, an MBA from the University of Southern Queensland, an MA from Deakin University, and is a graduate of the Australian Institute of Company Directors.